I am sick. Like “sick-sick.” Like the “I have the flu because I kept putting off getting the flu shot for myself, even though I had my kid immunized many months ago” kind of sick. Flu sick stinks. 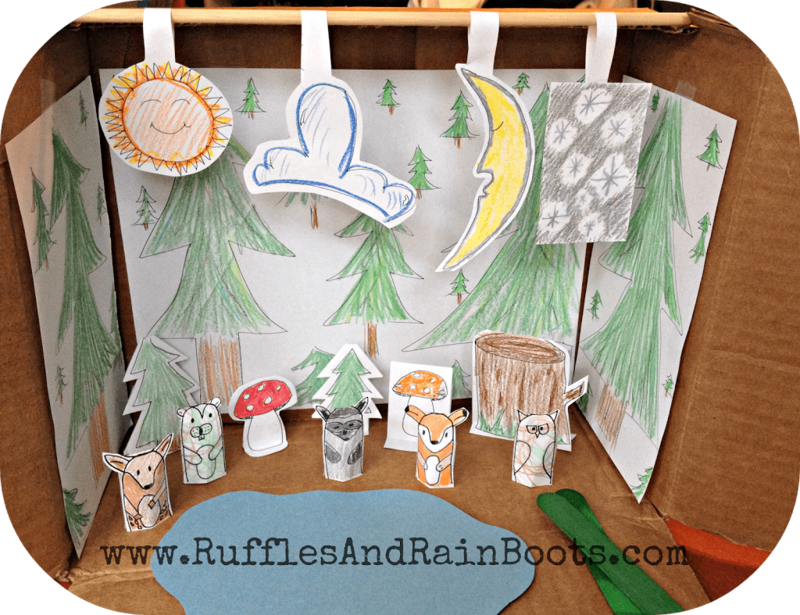 Needing something quick and fun to appease the cooped up two year old who lives here, I remember that I’d come across these free, printable, wonderful woodland animal finger puppets from Go Grow Go!. Quick? Check. Fun? Boat loads! And they’re free? Even better. Click “Read More” to join us in our wonderful woodland play land. 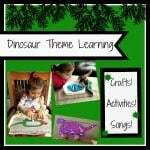 I came across this great printable on +Go Grow Go! and was impressed with their cute factor and the myriad of learning objectives we could incorporate. I printed these out last night after dinner and started coloring them while Elise was finishing up her nibbling. She colored some of the animals and then Jeff started the bedtime routine. While they were occupied with the bath, I figured that I could jazz things up a bit with a diorama. 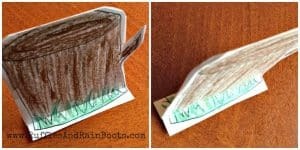 Copy paper and crayons to the rescue! Sun and clouds for day. Stars and sleeping moon for night. Check. And check. And a great toddler tool? 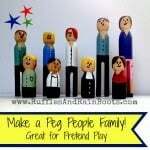 Popsicle sticks in case her little fingers get tired of holding the finger puppets on them. Nah, just kidding – it’s because she loves putting things on sticks. Here is the printable from +Go Grow Go!. Spend some time there, it’s really fun. If you’d like to quickly whip up a diorama or additional woodland creatures and scenery, instructions are below. 1. 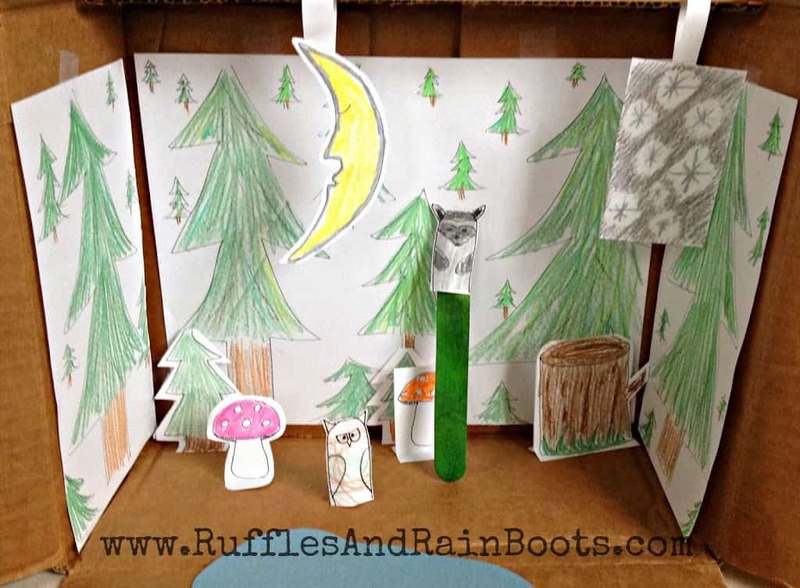 Print out Go Grow Go!’s adorable woodland creatures. Color and tape ’em up. It’s ok to pause here and basque in the cuteness of these little fellas. 2. 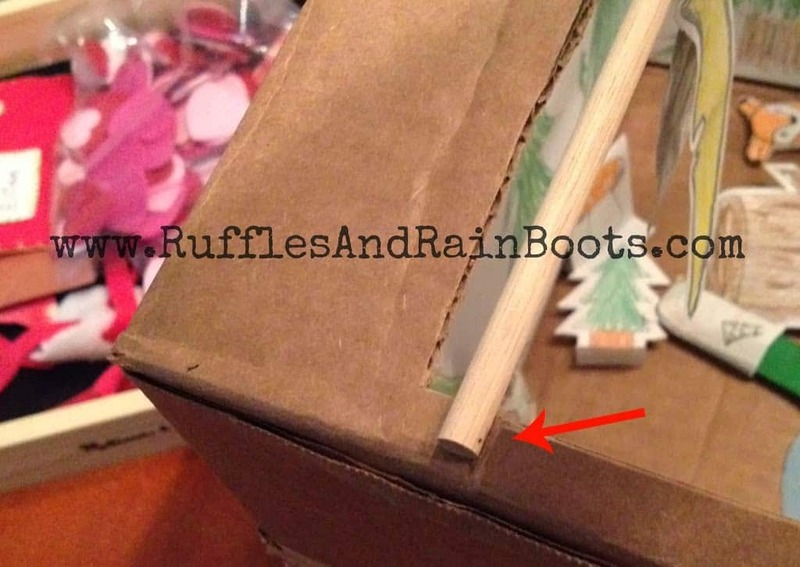 Get a box and cut most of one of the flaps off (this will be the top). If you want to hang a sun, moon, etc., you’re going to want a little bit of flap on either side to prop the dowel against. Picture at right. 3. 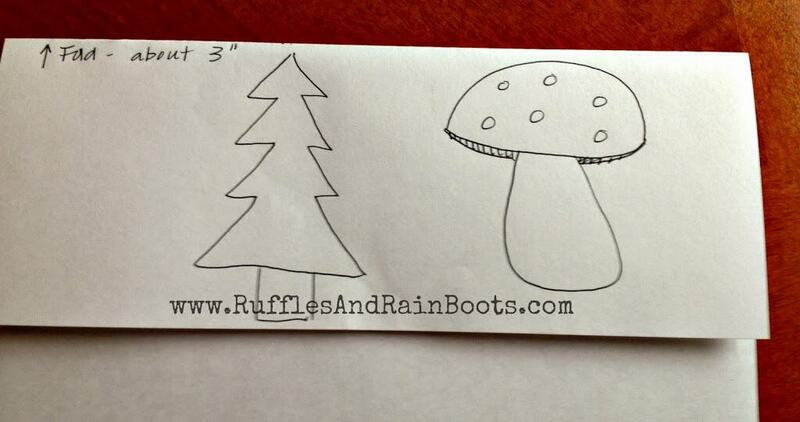 Draw some trees on some copy paper (8.5″ x 11″) for the back. Color and tape to the box. 4. 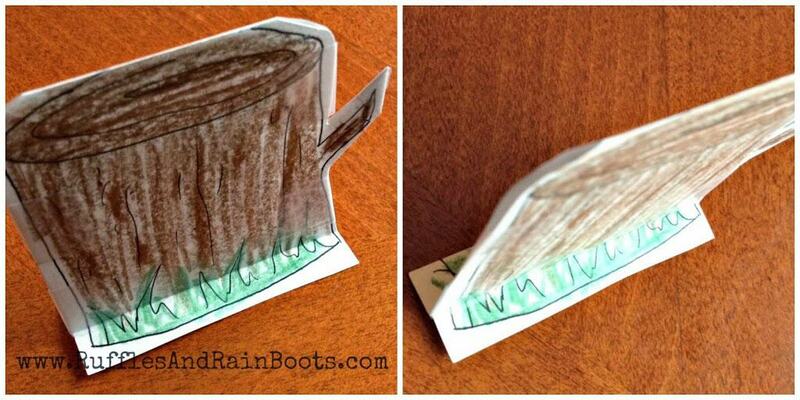 Draw some trees on a piece of copy paper cut in half (or thirds, depending on the sides of your box) for the sides. Color and tape to the box. A. From the top of the copy paper, fold it down about 3 inches. B. 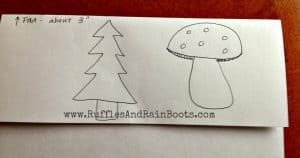 Draw a sun/moon, leave some space, draw a tree, leave some space, draw a mushroom next to it, leave some space, draw anything else you want… Like a stump, maybe? It did turn out to be a valid suggestion; Elise loves the stump. 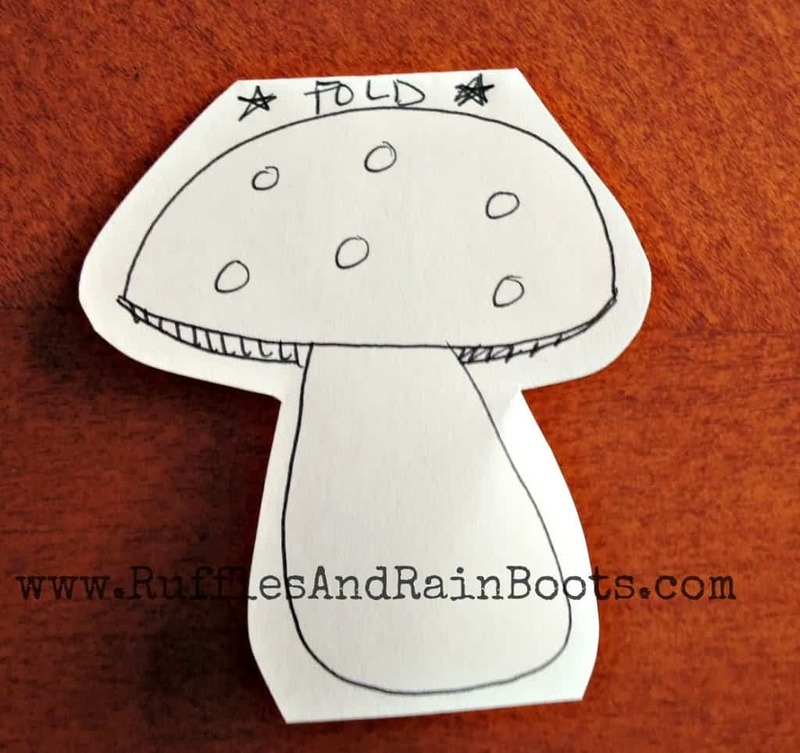 C. Cut out your tree, mushroom, stump, etc., being sure to keep the paper together. Before you cut, be sure to leave a bit of folded paper at the top! Color and tape ’em up. For the moon and sun (or anything hanging from the dowel), I cut a single layer of the image and then cut a long piece of paper to loop over the dowel and hang it. D. Flip it over and draw an image on the back. It can be the same image that’s on the front or it can be different. E. Color, or let your kid color them if they aren’t splashing away in the bath. 6. Set up your diorama. After you tape up the animals, they stay standing on their own. For the additions to your woodland scene, just turn out the bottom quarter of an inch or so on either side and they will stand up. Easy-peasy. This whole thing took about 30 minutes to set up and it was a very fun time or both of us. If you’d like to turn it into a learning opportunity, here are some facts about each animal. Fox – A fox’s den is normally underground but they can live in cozy hollows. A baby fox is a cub, pup or kit. Deer – Deer can jump very high and swim well. A baby deer is called a fawn. Beaver – A beaver’s front teeth never stop growing. Young beavers are called kits. Owl – There are about 200 different kinds, but all owls are nocturnal (active at night). A young owl is called an owlet. Raccoon – Very good swimmers, the nocturnal raccoon will eat almost anything. A young raccoon is called a kit. I talked about these little tidbits and we moved on, playing. About 10 minutes later, she then set up the following “not-turnal” scene. Yep, that’s supposed to be “nocturnal,” but I seriously was so surprised that she put the owl and the raccoon with the sun and stars. 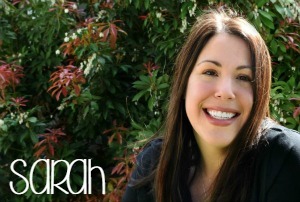 I was speechless until I finally blubbered out, “good thinking!” I know, parenting fail, but I was shocked. I really should get over it because this kid manages to impress me every day. I took tons of pictures, but because of the fun we were having – and not my poor photography skills – they were all fuzzy. Let me know in the comments section if you’re going to try out the free printable from +Go Grow Go! or if you set up a diorama. I love hearing from all of you! Have fun! Thanks so much, Felicia. Have a great day!